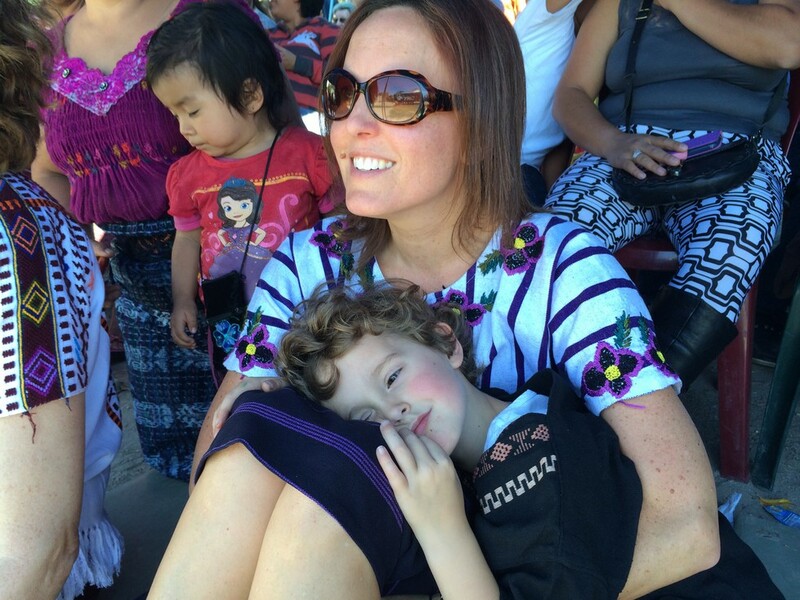 Orgullo Chapin, also known as Guatemalan Pride Day, is one of the many traditions celebrated the at LIFE School. 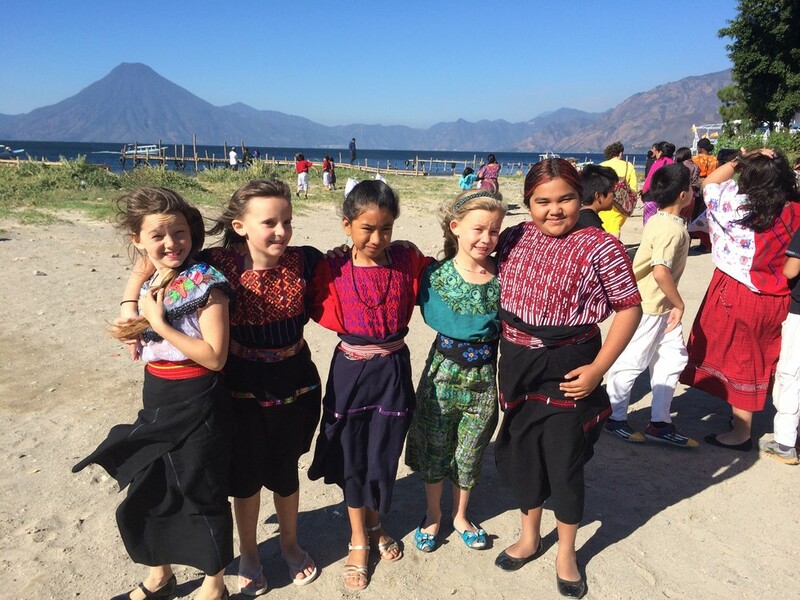 Everyone in the school dresses in traditional traje, or typical Guatemalan dress. Many teachers and students borrow traje from parents and other students. Some rent clothes for the day, and others buy. We did a little of everything. I was able to borrow a Guatemalan shirt, skirt and belt from a parent in Tag's class (she is the same parent that does our laundry weekly). We rented a traditional skirt, belt, shirt and scarf from a classmate of Elle's for Q30 (about $3.75). Tag is always more complicated when it comes to special clothes. After much discussion, cajoling, bribing and getting his teacher to talk-it-up, he agreed to a pair of bright red pants and a shirt that we bought ($12). There was nothing normal about our school day. It started with the whole school walking to the lake edge for class pictures. Elle and her friends at the lake. It was a bit windy. Some of the boys in their traje. Notice the boy second from left's liquor bottle. It's a prop for the presentation later in the day. There was a dead rat floating in the water. Fascinating to many of my students! We returned to school for a snack and a little free time before the dance presentations. Every class performed a traditional Guatemalan dance that they'd learned in Spanish class. Tag's kindergarten class, along with the preschool kids, sang a song and did some movements. Honestly though, most of the kids just looked around and "danced to their own drummer", exactly what you'd expect from a bunch of 3-5 year olds. This is the school's big soccer field. It's always dry and dusty. We covered the main dance areas with green pine needles for the presentation and it probably helped with the dust. Traje is quite colorful. I've only started to appreciate the colors and the designs and let go of my feelings about matching stripes with stripes or vertical stripes with horizontal stripes. The kids were adorable, and I'd love to see Tag wear clothes like this every day. It's worth watching the video to see all the different traje the kids are wearing. Elle's class performed some sort of engagement ritual. By the time they performed it was near lunchtime and they seemed to enjoy the bread, drink and sauce that was their props as much as the actual performance. I wish I could tell you more about this, but the narration was done in Spanish. I was clueless as to the significance of the dance for most of the presentation! An hour and a half and 7 class performances later, it was over. Nothing moves quickly in this culture. Elle is passing out bread to the audience as part of the Spanish Engagement dance. Did you like the fireworks in the video? Guatemalans love fireworks. We hear them day and night. The little girl in the pig tails is a younger sibling to two other students. She and another little boy joined several of the performances. They were quite entertaining and, in my opinion, didn't detract from the presentations. The first graders did a traditional dance about the Day of the Dead, which took place Nov. 1.. Each child had a different big kite strapped to their back. It was a surprise. Even their teacher was surprised to see them in kites! It was a long performance. At least I got some cuddle time with my son. All of the students, along with many parents, returned to the students' classrooms and enjoyed a potluck with many traditional foods. Elle is always hesitant to try anything new. She enjoyed some chips, a piece of watermelon and a strawberry/banana/pineapple smoothie. Ken attended Tag's classroom potluck and observed a mad dash for the food even before everything was ready to be served. One mother clobbered her way to the ideal spot where she slowly and deliberately fixed her son a beautiful plate of food. She maintained a football player stance and didn't allow anyone to jostle her. The original top Elle was going to wear didn't fit over her big head! Traje is often made to fit a specific individual and women often tailor it to fit themselves perfectly. One teacher borrowed a shirt and the sleeves were too tight. The loaner took it home and loosened the arms so the teacher could wear it the next day. What you can't see is my cell phone and other misc. items tucked under the belt between the skirt and the shirt. I always see women in town with their phones and small wallets tucked into their belts, and I was eager to see how this worked. I'm glad we had the chance to wear traje as I never would have done it without being pushed. It was fun and surprisingly comfortable. After lunch, everyone went home. The teachers stayed another hour to help clean up the school and the week was over. The next day was Valentine's Day. We hadn't mentioned it to the kids and there were no Valentine's Day celebrations at school, but there had been cursory talk about it. We intended to almost ignore the holiday and enjoy another relaxing, unscheduled weekend. However, the minute we were awake on Saturday morning, Ken and I were yelling, "Happy Valentine's Day" to the kids. This quickly followed with a special breakfast at Mister Jon's for pancakes and eggs. Before we left the house, Elle and I were researching sugar cookie and powdered sugar icing recipes. Obviously, we're incapable of ignoring a kid holiday, but it was still low-key. The kids insisted we all wear pink or red today! I love waking up to empty days and filling them with those things that make us happy. Pancakes, making sugar cookies from scratch, cuddling, listening to the kids play with legos and Monster High dolls, an iced latte from Crossroads Cafe and a brief stop at the market to pick up ingredients for homemade spaghetti sauce are some of the little things that make our life carefree and full. 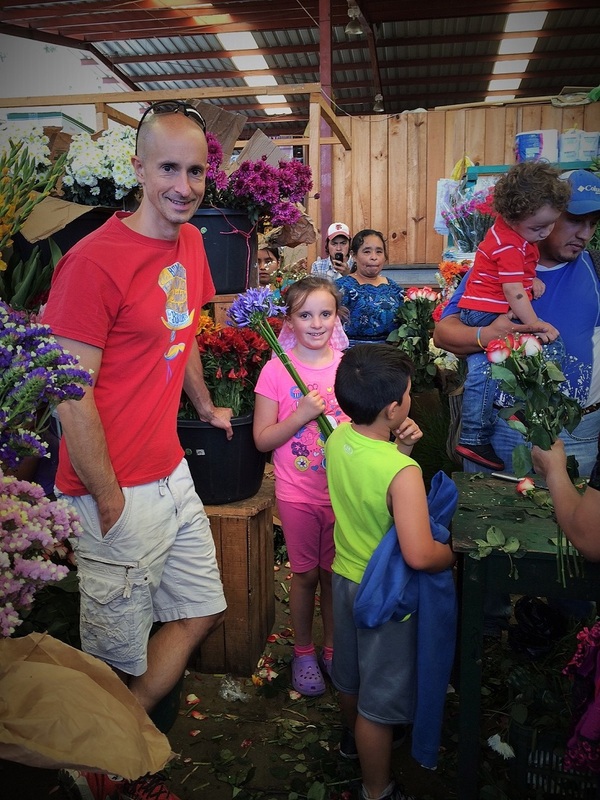 Elle bought me flowers at the market. My sweet girl! An extra treat - The kids and I got to play with the neighbor's 5 week old puppies. Elle's favorite is the multi-chocolate colored puppy, while Tag likes the blond one. Happy Valentine's Day to all of you from the four of us. We hope your world is full of love and happiness.